There are conundrums for expert puzzle solvers: the most clever cryptic crossword connoisseurs will be challenged by these, and something for the children and those who like to take it a bit easier as well, like word searches and spot the differences. There are all levels of Sudoku, including the Killer Sudoku, guaranteed to kill or cure you. Either way, you won’t be able to stop thinking about it! Puzzler Collection magazine always comes with a free pen, so you can get started there and then. Puzzler Collection has more than 170 different puzzles of all types with every monthly issue, including all your favorites like crosswords, Puzzle Corner Special, code words, word searches and criss crosses, as well as logic problems, sudokus, cross-quizzes and skeleton crossword, and many more we don’t have room to name! 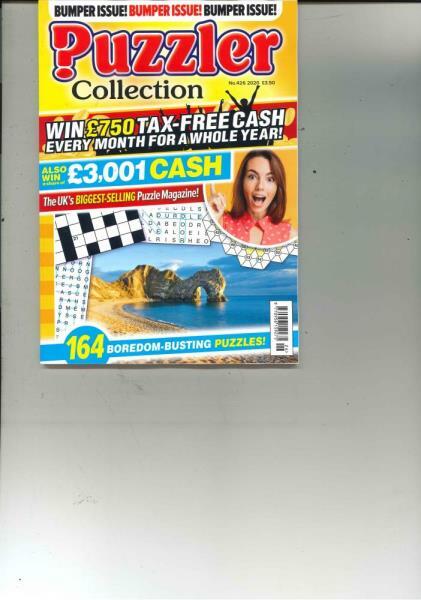 This monthly GAMES Magazine spin-off offers sixty-plus pages of 'crosswords, word searches, picture puzzles, cryptograms, trivia, logic, double-crostics, cryptic and other pencil puzzles' reminiscent of GAMES' signature Pencil wise section. Most puzzles are rated on the standard one-to-three star scale of difficulty. The center of each issue contains a ten-page 'special section' of related puzzles.